The Dino-Lite Premier AM5018MZTis designed for connecting directly to HDTV or LCD monitors with HD 720p format, making the AM5018MZT be most suitable for applications such as but not only: quick inspections, assembly lines, presentations, training, and more. The AM5018MZT is one of the DVI interface microscope that feature an adjustable polarizer to help suppress unwanted glare or reflections. The AM5018MZT's MicroTouch provides the convenience to freeze the live video to examine details with a simple tap. The LEDs can also be switched by tap and holding the same MicroTouch for two seconds. 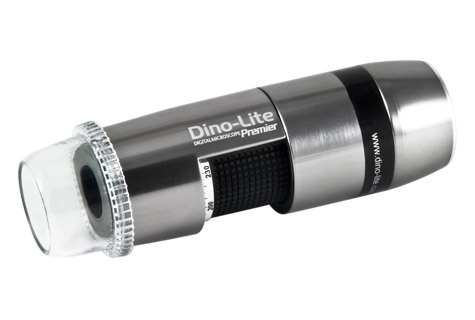 In similar to most general purpose Dino-Lite models, it has adjustable magnification from 20x to 50x varied with working distance, and be further zoomed to more than 200x when close to the object.